Description of "Presumptive Tax for Business and Professionals (Explained with Illustrations and Charts)"
Facts For You, April 2014 by EFY Enterprises Pvt. Ltd. 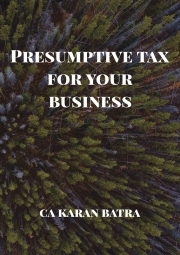 Reviews of "Presumptive Tax for Business and Professionals (Explained with Illustrations and Charts)"